I promised to do video tutorials about Alpha Channels several weeks ago. I finally bit the bullet and produced 7 videos. Before you start to watch, if you haven’t already watched the videos on selections, please do so. An alpha channel is simply a storage device for selections, so you need to be familiar with selections to see the power of Alpha Channels. I didn’t cover every thing about alpha channels; it would be impossible in 7 videos. My class on Selections, Channels, and Layer Mask for Painter 11 has around 30 videos. There is enough information to get you started with channels and how to use them with a watercolor painting. 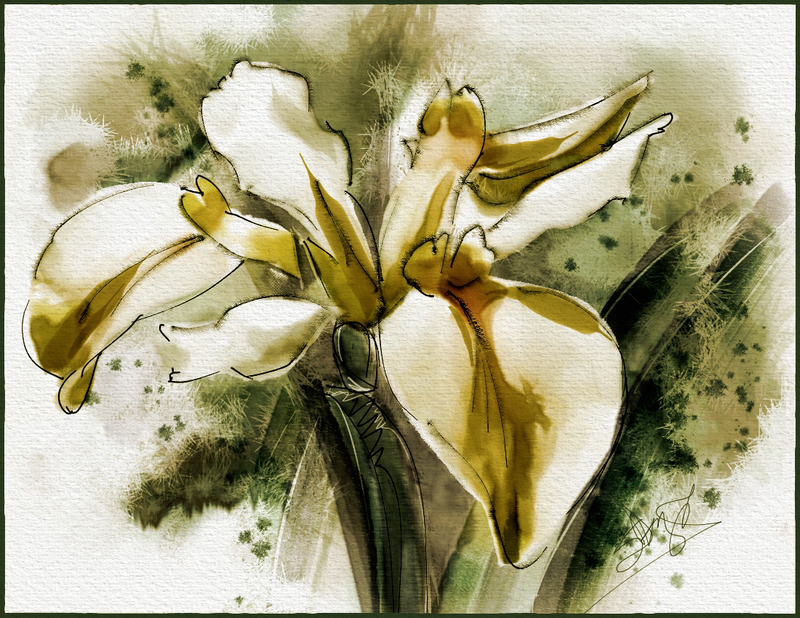 At some point in the videos, I begin painting an iris. I used one of my photographs as a reference and I cloned the image. I received so many requests for more on cloning and channels. There is a lot in this post; have fun. The final image looks like this, but believe me when I tell you it didn’t look like this until the end. I had a lot of fun painting it…well, it got a little tense at the end. I show you everything and it was taking so long I felt I needed to speed up. I thought I could do some stuff off camera and I did a little, but I forgot to turn off the recording. In the first video, I give you an introduction to alpha channels, which from now on I will refer to as channels. A channel is a storage device for selections, so I explain how that works. Video two demonstrates how to use the channel panel and its various functions. This is where the power of channels begins to shine. The third video I start getting the reference ready for cloning. I took my original photo and changed it in different ways and then set each variation in the clone source panel. In the fourth video I actually begin painting. About time, right? I usually start with a sketch and the background. In this case, I used the reference as a guide for the sketch. It is a simple way to plot a map for your painting; even folks who can’t draw can do this. And now for the fifth video. “Good grief. How many of these things did you say you did? Nobody is going to watch them.” Kevin suddenly appeared and startled me with his jibe. “Buds? What buds? Are they viruses like you? Are they good viruses like you supposedly? Have you infected my computer with your friends,” I wailed. My voice sounded a bit too high-pitched. “Never you mind about my friends. They are my friends and they are here to stay! See you later.” And with that he was gone. Oh my gosh, what now. Okay, the fifth video I start painting the flower. I have no idea what I did in the sixth video. I know I thought I was close to the end, but no…there is another video after this one. In the seventh and final video, I finish the piece. Aren’t you glad? The image takes on a completely different look. I like the finished product. PS: I just realized that I haven’t posted the brushes that I used. It is very late and past my bedtime. I promise to post them tomorrow. See ya then! Wow, this is so much easier than what we had to do before. Everybody…upgrade to Painter 12.1 today!!! Our first Open Studio starts tomorrow at the Digital Art Academy. Corel Painter Master Karen Bonaker is the instructor and we have a special guest, Denise Laurent, who is the creator of Dens Oil Brushes. Karen’s Open Studios are always fabulous and I learn so much from them. You can register up until the end of the first week of class, but do try to join early tomorrow. Karen scheduled the first live session at 12 Noon tomorrow Eastern…or New York Time. If you miss it, no problem, recordings are posted for all participants. So what is Open Studio? 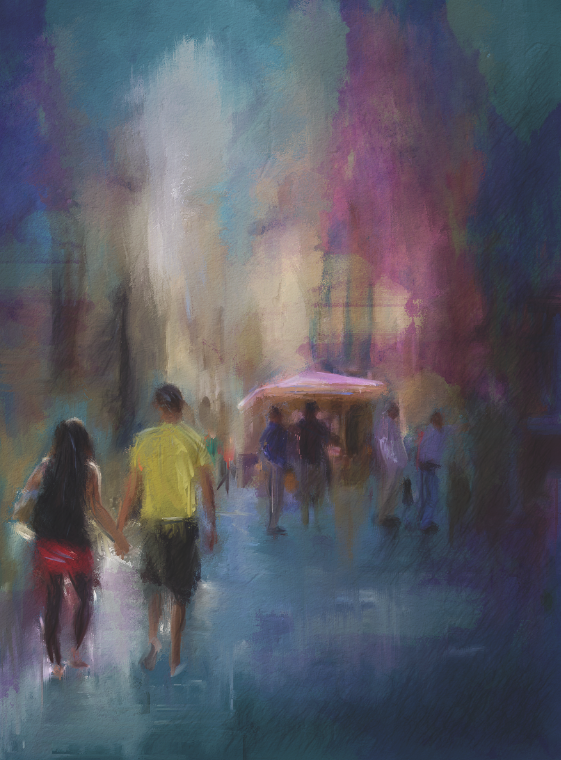 It is a class session for everyone with a skill level of Intermediate or Advanced with Painter. 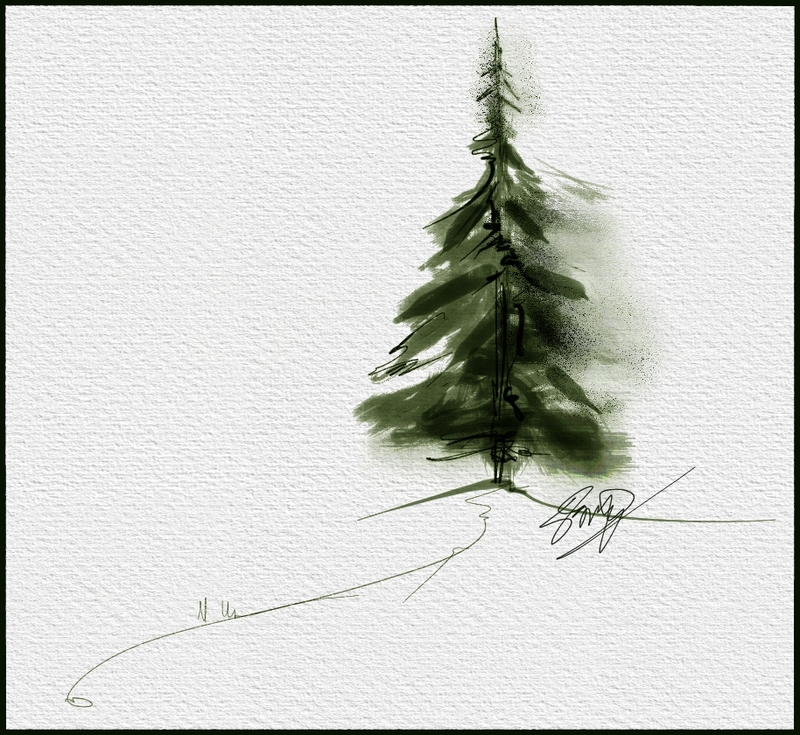 Karen uses Painter 12.1 for her demos, but you will be fine with versions IX – Painter 12.1. But take it from me…upgrade to 12.1…you will be glad that you did. Karen visited the Tuscany countryside in Italy and brought back tons of wonderful pictures. She offers her pictures as references or use photographs of your own. There is a specific goal outlined each week, which help us expand our knowledge of the software and find inspiration in the world around us. Karen has posted two images for the live session tomorrow. I don’t know what she has in store for us, but it looks like she wants us open for change experimenting with the subject as we go. Here are her two images posted. Aren’t they wonderful? I can’t wait for class to start. 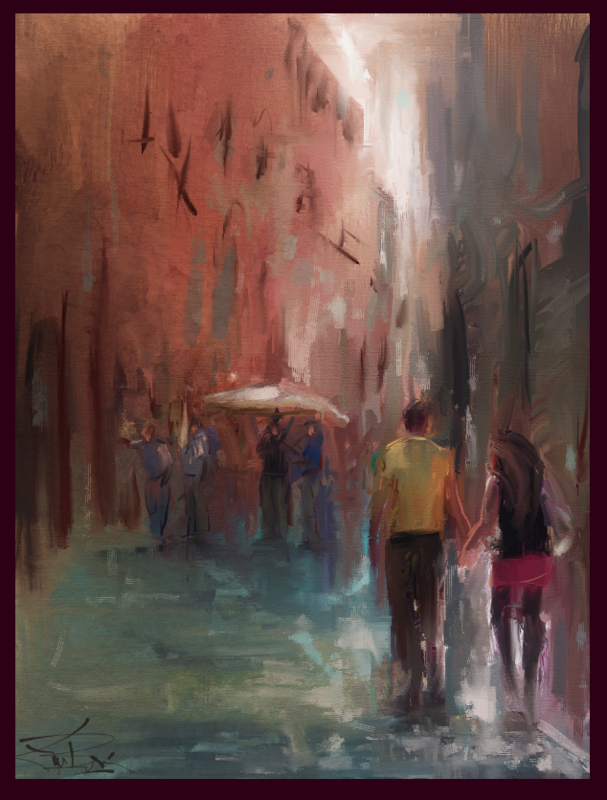 One of the Street Scenes for discussion in live session. .To register for the class go to Digital Art Academy Open Studio. I know you will love this class!!! Skip PS: Here is a note that describes the skill level needed in the class. Beginners with exceptions. 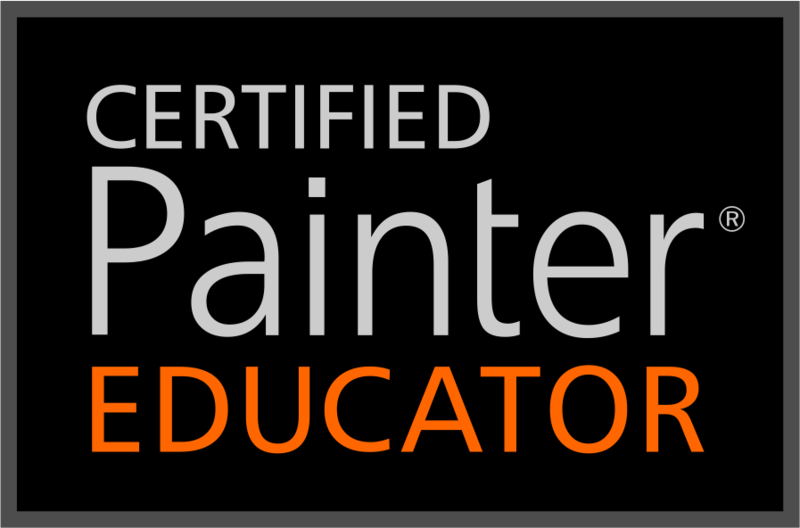 If you are just learning how to use Painter, this may not be the class for you. But something to look forward to as your skill set improves. You should know your way around the Interface and be able to add layers, understand how to use the Quick Clone function, and be able to work with a custom set of brushes.